I've been coming to the North Carolina coast for over five decades. We also lived in Atlantic Canada, another seafood heaven for seventeen years. We have eaten seafood in Australia San Franciso, Seattle, Alaska, and in Europe. I've gotten so that I prefer Icelandic Atlantic salmon when I can find it. I have been known to haul it from Northern Virginia to Roanoke, Virginia. While I might not have seafood expert stamped on my forehead, I love expertly prepared fish. I find that the closer you get to the salt water and the real fishermen, the better the fish usually tastes. Recently I've been raving about some seafood restaurants in Beaufort, NC. As far as I'm concerned, at least in "Grouper category," there is a new champion. It happens to be Riverside Steak and Seafood in Swansboro, NC. I recently had a piece of grouper there that I believe to be the best piece of fish that I've ever eaten in my life. 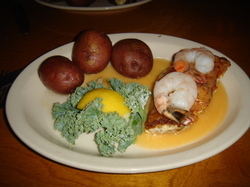 I enjoyed the "House Grouper" dish which is topped with lobster buerre blanc and two jumbo shrimp. This picture doesn't do the piece of grouper that I was served justice since from the angle of the picture you can't appreciate that the grouper was between one and two inches thick. It was absolutely perfectly cooked, moist, tender, and flaky. Great fish like this doesn't happen by chance. It takes lots of practice and care even with grouper. The entree which included a salad and the house special sweet potato muffin was very reasonably priced at $21.95. On top of the great grouper, the lemonade which I ordered to accompany my meal was exceptional. 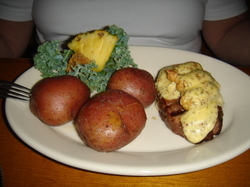 Glenda, my wife, had a five ounce Filet topped with oysters in a Bearnaise Sauce. It was also done perfectly. Glenda claims the oysters were absolutely "delectable" and her meal including the salad was less than $19. 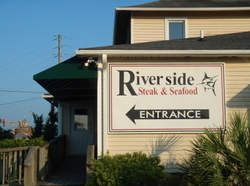 The Riverside Steak & Seafood is easy to find. It's on the left on Highway 24 just before the bridge in Swansboro if you're headed east. They're open year round and open each day at 4pm. You can reach them for reservations at 910 326-8847. It doesn't matter even if you're coming from the seafood mecca of San Francisco, you'll still be exceptionally surprised at the food that John Kilgore (pictured on the left below) and his very pleasant staff put on your plate. 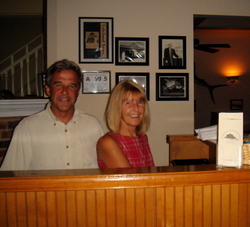 You'll find a great meal in pleasant surroundings with watchful service. On top of that you'll be dining in one of the most naturally beautiful and relaxing areas on earth. That's a hard combination to beat. This restaurant used to be my grandmother (Opal Jones) home.I spent most of my summers there with her. It was like my own personal heaven. I went with my mother, her daughter, to see it a couple of years ago (it was still Riverside) but we got there about an hour before opening and were told that we could not go inside. I suppose I might not want to go inside anyway so that I can remember it like it was. I live in Michigan now, so the chances I get to go to the area are not many. Have lived in the Eastern Carolina area many times over the last 30 years and as a former Marine, have travelled literally worldwide and throughout the U.S.
Bottom line - Riverside is as good or better than any food that I have enjoyed. And that is saying something my friend.